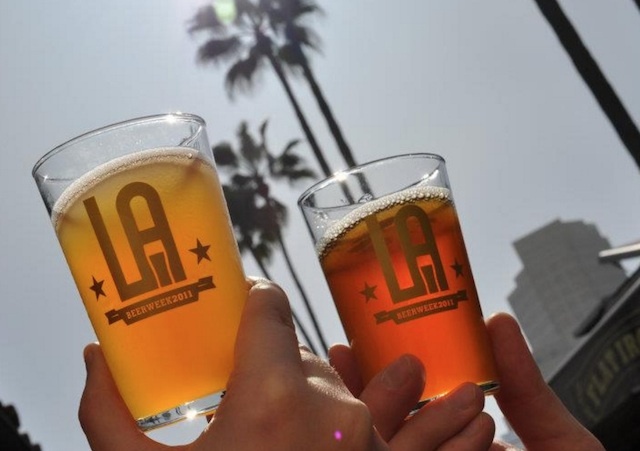 The annual L.A. Beer Week returns this June with a bigger-than-ever kickoff festival with unlimited tastings from an excellent lineup of craft brewers, new food options and more. If you&apos;re head is swirling with the thought of touring the rapidly expanding roster of breweries in Los Angeles, you&apos;re in luck. The L.A. County Brewers Guild is hosting their 8th annual week-long celebration of all-things-beer from June 18 to 26 with fun events happening all over the city. The week will start off with a huge festival on June 18 from 1:00 p.m. to 4:30 p.m., which will include beer tastings of over 200 beers from more than 80 brewers, including local favorites and others from California and beyond. There will also be food trucks to keep you from floating away, plenty of entertainment, panel discussions with brewers, and lots of bathrooms (thankfully). This year the event has expanded to downtown&apos;s Los Angeles Center Studios, which Frances Lopez, executive director of the Brewers Guild, assures us is intended to reduce congestion so that you can more easily get your beer on. "Our goal here at LABG is to optimize the beer festival experience as best as we can every year so we are growing our footprint, but not our crowds," she says. General admission to the Kickoff Festival is $45 plus fees, which includes unlimited 4 oz. tastings in your own special commemorative glass. VIP tickets are available for $65 plus fees and include early access to the event at noon. There are also designated driver tickets for $20. This year, a portion of the proceeds will benefit Food Forward, a non-profit that reclaims and harvests fruit and vegetables from local sources that would otherwise go to waste and gets them to people and organizations who need them. This year&apos;s lineup of breweries is larger than ever and features 46 local favorites, including Highland Park, Three Weavers, El Segundo, Beachwood, Monkish and more. There will also be tastings from highly sought-after breweries including Societe Brewing (San Diego), Sante Adairius (Capitola), and Cellarmaker Beer (San Francisco), plus guests from neighboring Orange, Inland Empire, and Ventura counties. So, you better come thirsty. The food options are still being finalized, but so far you can count on beer-friendly BrewWings, as well as some non-food truck offerings from The Oinkster. You can also expect live music from beer-nerd-favorites The Firkins, and a special performance by a super group of L.A. Brewers, which will give you a sneak peek at the 3rd Annual Battle of the Brewery Bands hosted by Eagle Rock Brewery later in the week. The event will also feature games, a photobooth and other fun stuff. Stay tuned for more updates on beer-related activities throughout the rest of L.A. Beer Week. And keep an eye out for this year&apos;s Unity beer, an annual tradition where local brewers collaborate on a special brew in honor of the occasion. This year, Unity will be brewed at Three Weavers Brewing and will be a unique IPA featuring some new experimental hops. The beer will launch on draught and in bottles at the end of May. You can learn more here and you can purchase tickets here.